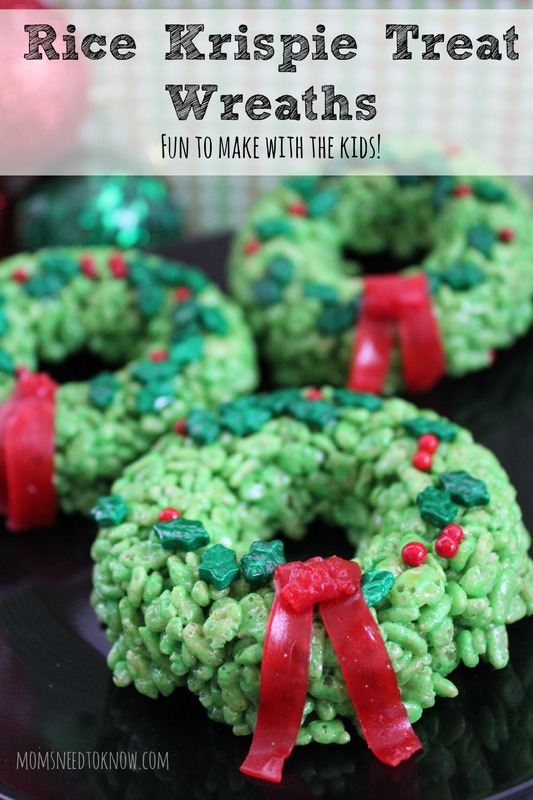 So after I made my baked chocolate glazed donuts, I was looking for another use for my doughnut pan, and this Rice Krispie treat idea is just perfect for that pan. Children just love Rice Krispie Treats (and let's face it – so do us parents!). This is just so easy to make and your children will have fun making them with you. They are just the perfect addition to your holiday table! Stir in enough food coloring to make the marshmallows very green. Remove from heat. Add Rice Krispies cereal and stir until cereal is well coated. Prepare the donut pan by spraying with cooking spray or coating with butter. Distribute the candy decorations around each donut cavity. Butter a spoon or your hands or use wax paper to press the mixture firmly into the pan. Give them just a minute to cool, then flip them out onto wax paper and repeat process for remaining mixture. Cut off roughly 4″ length of fruit strips. Cut in half lenghtwise. Fold over each side toward middle to make bow (you don't need to tie as this sticks to itself instantly). What is your favorite Rice Krispie Treats Idea? Aww these are so sweet! My daughter is obsessed with make rice crispy treats, she’d be so in love with these! I love this Christmas wreath. Thank you so much for linking it up to Wonderful Wednesday blog hop. I pinned it on our Wonderful Wed. Blog Hop page. Super fun treat for the holiday! Thank you for sharing on Merry Monday! Pinned! Have a great week!